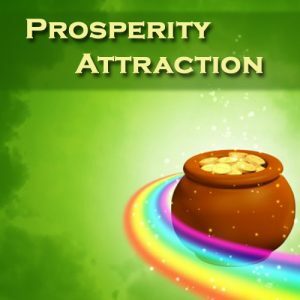 Attract Prosperity! Is that really possible? Could you truly ‘attract’ prosperity into your life? Is it possible to push prosperity away? If you do not believe you deserve a better job, will you take action to make it happen? Or will you push that idea away? If you believe money is the root of all evil, will you accept it when it comes your way? Or walk on by? If you believe your friends will disown you, when you become successful, will you self-sabotoge once again? Your beliefs, both consciously and unconsciously, affect what you attract into your life, and, what you push away. Everyone has a Prosperity Set Point, very similar to a weight set point (people in Weight Watchers know about this.) A person may lose 20 pounds, gain it back again, and the weight bounces around, near the weight set point, until they do something to shift that set point. Your Prosperity Set Point works the same way. You may gain a fortune, then lose it again. But you will always stay near your Prosperity Set Point, until you do something to change it. This is why some people win the lottery, and in a year the money is all gone. Yet others can fall deep into debt, but soon they are back where they started. In both cases, they are floating around, near their Prosperity Set Point. How can you shift your Prosperity Set Point? To shift your Prosperity Set Point, you need to create a shift it at the subconscious level. In the same way a person can shift their weight set point, you can shift your Prosperity Set Point. By applying the tools in the movie Beyond Belief, you will create the shift at a deeper level, remove inner blocks, and raise your Prosperity Set Point. If you have not yet seen Beyond Belief, watch in now. Then take the next step and listen to this self-hypnosis recording, to shift your inner beliefs around money and raise your prosperity set point another notch.